You are currently browsing the tag archive for the ‘Fort Collins Museum of Art’ tag. 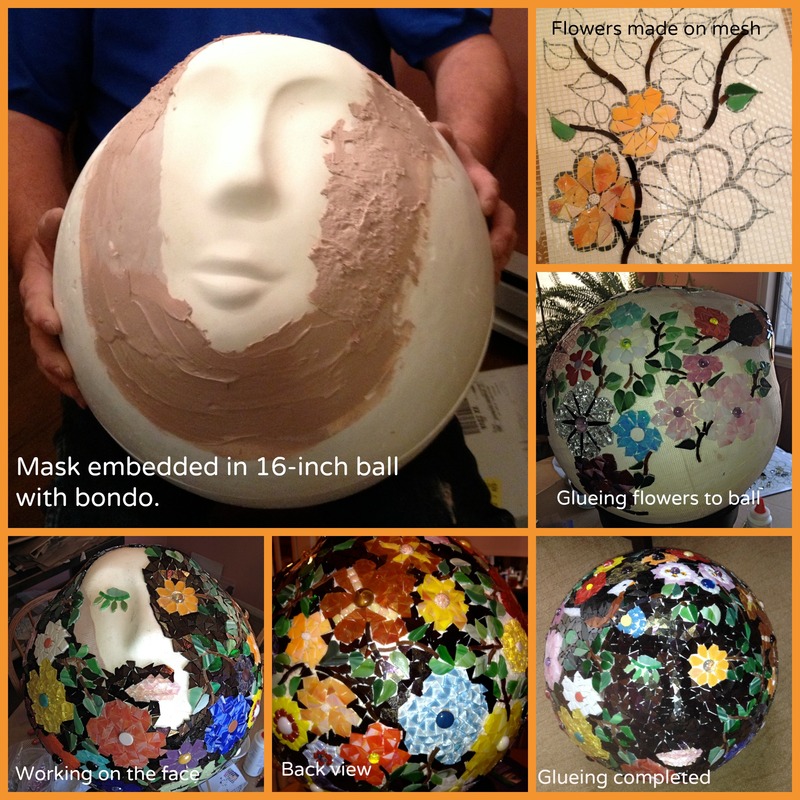 Our mask: The Earth Laughs in Flowers has been chosen to go to the live gala and auction to raise money for the Fort Collins Museum of Art. It’s quite an honor to be selected. Ten masks from an amazing collection of two hundred were chosen. And Lucille made the cut. Woo Hoo!! My sister and I are honored and humbled to be in the company of some awesome artists. If you haven’t yet seen the show, there is still time because it runs through May 2nd. Get yourself to the Museum of Art in Fort Collins. You won’t be sorry. The creativity expressed is truly awe-inspiring. For the past several years, my sister and I have participated in the Masks Exhibit at Fort Collins Museum Of Art. Each artist receives an unfired ceramic mask as their blank canvas, and then look out because creativity explodes, resulting in two-hundred amazing masks. I felt drawn this year to create something inspiring and hopeful for our community. We’ve been through two very tough years. Fire and floods have ravaged many parts of Colorado, leaving so many people hurting. We’ve been pretty upset with Mother Nature. My plan was to remind us of the softer, gentler side of nature. The side where flowers bloom in lush abandon. No more fire. No more flooding. And maybe a bird or two thrown in for good measure. It all seemed perfect. My sister and I set to work making almost two-hundred flowers–thousands of pieces of hand-cut, individually glued pieces of glass of every color we could imagine. As we worked on the old girl, we fondly dubbed her “Lucille.” You know–Lucille Ball! Actually that came from my husband, and it stuck. Lucille is a woman of substance–she has heft. Round and balanced and, well, earthy. I don’t know about you, but I like that. I want Mother Earth to be substantial. No wraith-like, skinny girl who lives on nothing but celery and lettuce leaves. In my view, Mother Earth has to have a strong presence. She withstands a lot–and yes some of her own making. Still, she needs to be able to pack a punch if need be. In the picture above where Rick is holding her, you can see that she’s a big girl. She’s sixteen inches in diameter, which translated to a whole heck of a lot of surface area to cover in glass. When we started the project, the vision was to tuck a sky blue, or maybe a soft, grassy green around the flowers. But when we got to it, we found that ME(Mother Earth) wanted to be much more earthy. We ended up choosing a gorgeous, coppery, iridescent brown and she was quite satisfied. Interesting in art (and life sometimes) how the project takes on a life of it’s own. Lucille definitely was running this show. And now the shameless self promotion! Lucille could be yours. For the right price, she’s available. And get your mind out of the gutter, I don’t mean LIKE THAT! This is Mother Earth we’re talking about. The Earth Laughs in Flowers – aka “Lucille” is part of a fundraiser for the Fort Collins Museum of Art. This glorious exhibit opens in Fort Collins Friday April 4th and runs through Friday May 2nd. All that while, you can bid on the masks. And mark my word, there are some stunners. Lucille is in very good company. We want Lucille to go to a good home. If you have a garden, or love flowers and the earth, or are drawn to the ancient artform of mosaic, then you probably have the perfect place for her. I’m a country music girl. Always have been. So visiting the Hall of Fame was a big thrill for me. But what really has stayed with me is this motto. To me it’s much bigger than music. It’s about being true to myself, which isn’t always so easy to do. We live in a society that often asks us to fit in; adopt everyone else’s ideas or principles; not to rock the boat. I believe we each have our own unique song to sing, and that we’re here now to sing it. “Honor thy Music” reminds me to sing mine. I’ve been working diligently on my entry for this year’s mask fundraiser for the Museum of Art here in Fort Collins. For a long time I’ve wanted to mosaic a guitar and this seemed like the perfect time to do it. Here’s a sneak peek at my finished piece. You’ll have to attend the show in April to see the guitar and many other amazing masks. In the meantime, I leave you with this question: Are you singing your song? 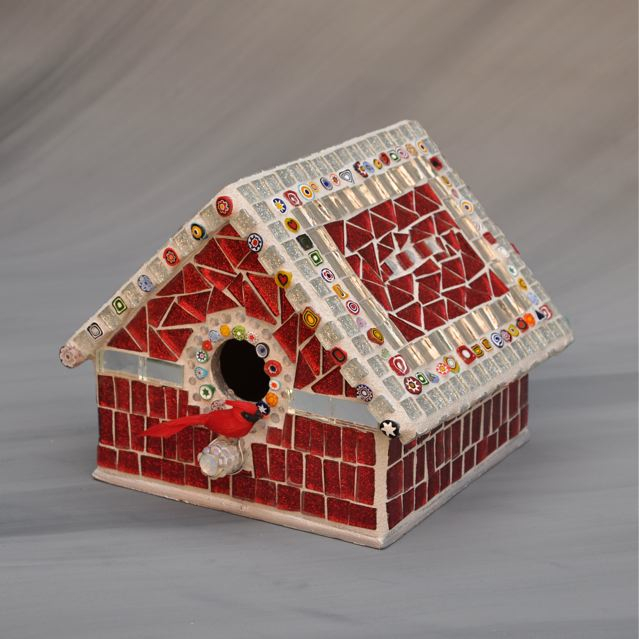 Mosaic birdhouse donated to The Food Bank and Neighbor to Neighbor April fundraising event. In our community, artists are some of the most generous folks around. I’m certain that’s true in other parts of the country as well. Here in northern Colorado, like everywhere else, the needs are great and the money is short. There are so many worthwhile causes. Organizations need multiple fundraising events every year simply to keep their doors open. A popular event around town is the silent auction. It must be successful because everybody seems to be adding auctions to their fundraising arsenal. As I attend these various events, I see generous contributions from local artists. Time and time again, these talented people donate gorgeous artwork to raise money. If a person wanted to add to their art collection, the silent auction is a great way to do it. You can snag something from one of our local art superstars or give a boost to some of the amazing up and comers. And at the same time, help your favorite organization raise money. Seems like one of those win-win situations. I’m proud to say that over the years, Two Sisters Mosaics has participated in many silent auctions. It’s our way of lending our support to our community. Many years ago I was talking with a lovely woman who’d graduated from Colorado State University in the 1930’s. She was an active donor to the University and involved in many alumnae events. She said, “Service to something we believe in is the rent we pay for the space we occupy on this planet.” Her words have followed me, inspired me, and definitely encouraged me to do what I can to pay my own rent. If you’re local, there are two events this week where you can “pay a little rent” and add to your art collection. You could even get something from two up and coming mosaic artists. The Museum of Art is winding up the Mask Exhibit on Friday. If you see something you like, get in there just before 9 PM to place your last bid. Our donation, Thought Bubbles might be just the piece you need for that special place in your home. And tonight, the Mathews House is holding their annual event called Cultivate Hope. You can find more details on their website. You’ll find a wide variety of artwork with a garden/growing theme. 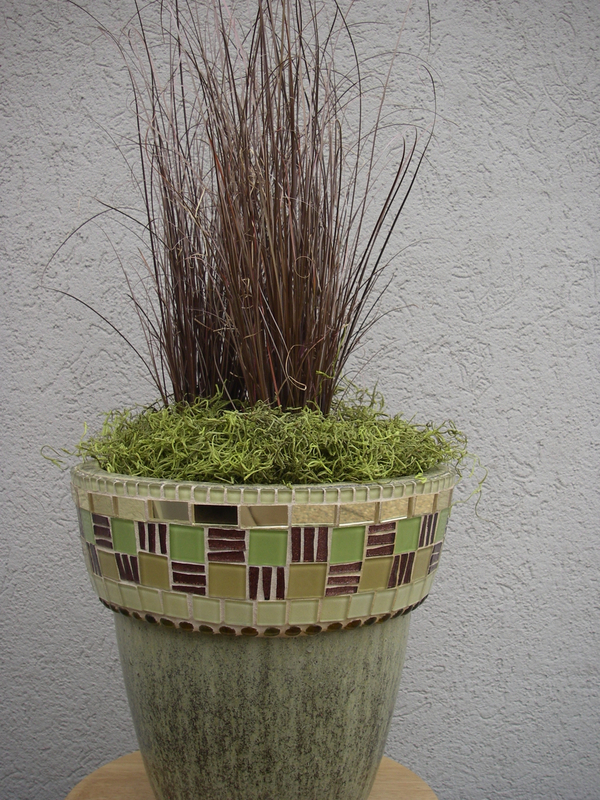 We partnered with a friend at Garden Thyme to put together this planted mosaic garden pot. She did the plants and we did the mosaic. Wouldn’t it be great on your deck this summer? If you’re not local, please enjoy this little peek at our artwork! Each of us is creative and energetic. What do you do to help “pay your rent?” Leave a comment below. I’d love to hear. Among the many things that draw my interest and keep me busy these days, is the ancient art form of mosaic. Five years ago my sister and I began making contemporary glass mosaic under the name Two Sisters Mosaics. It has been one of the most gratifying endeavors I’ve ever undertaken. This may sound somewhat melodramatic, and I apologize in advance, but I believe I’ve been preparing to do mosaic my entire life. I’ve dabbled in needlework, quilt making, collage, mixed media assemblage, and scrapbooking. And each has come in quite handy, as I’ve learned to cut pieces of glass and glue them into a beautiful design. For the last four years, Two Sisters Mosaics has participated in a fundraising event for the Fort Collins Museum of Art. Artists and community members are given a blank mask and invited to decorate it. The finished masks are put on display at the museum and auctioned to the highest bidder. Most are done in a silent auction format, and a few are selected for a live auction and gala event hosted by the museum. This year, the show opens the first of April with the masks on display for the whole month. The gala event and auction is on April 30th. If you live in the area, you really should treat yourself to see this exhibit. It’s always amazing to see the depth and breadth of creativity from the participants. My sister and I have worked out a system where we alternate years conceptualizing the mask design and doing the bulk of the work. It is simply too small a canvas for both of us to work at the same time. This happened to be my year. I wanted this year’s mask to represent the thousands of thoughts that exist in a person’s mind every day. The deep, connected thoughts as well as the random ones that flit through one’s head without ever sticking. The piece is entitled “Thought Bubbles.” It’s gorgeous in person (if I do say so myself!) 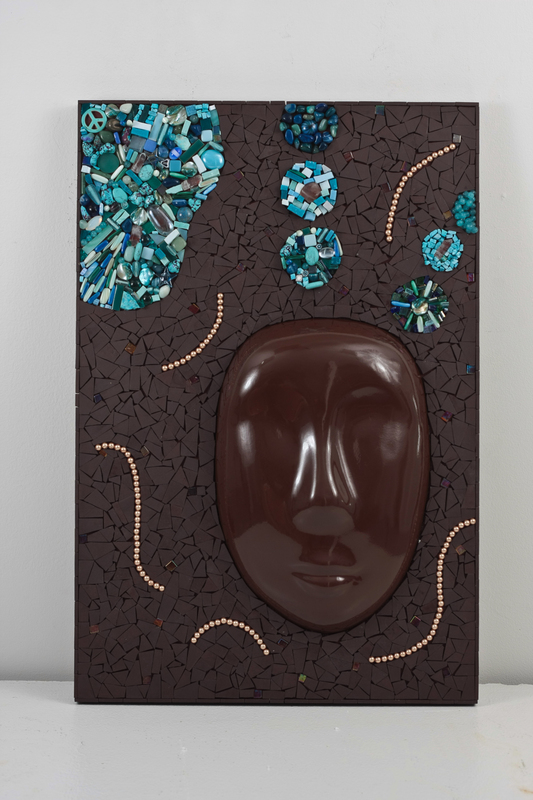 The mask looks like melted chocolate and each turquoise stone and bead represents a thought. I hope you’ll take a trip to the museum to see it. Of course, I’d love it if you place a bid.